Our ability to think free, creative thoughts places, paradoxically, new constraints on us; for we now have to learn what to think about, and learn to accept responsibility for our gift. Mankind has developed the faculty, alone among all life forms on our planet, to think and reason. This unprecedented step has led us into the steep learning curve that now characterises our cultural age. Peoples' thinking perspectives tend to be modelled, inevitably, by their social and cultural conditioning. The cultural inheritance of the last 2,000 years has been modelled, in the West, by the Christian ethic. Any philosophical deliberations have been limited by what has become our thought conditioning. We believe what others want us to believe, condition it by what we experience on the way and modify it periodically to appease passing whims. 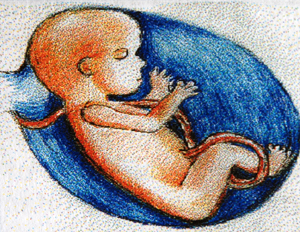 Developing human foetus in the womb. Mature at last, the grown child now reviews his place in the world of mankind. We are herd animals, and the herd instinct is expressed by a desire to follow a leader, like ‘The Prophet’, ‘The Saviour’ or ‘The Master’ (whomever we may project upon to carry this role). We seek coequal dependence at the expense of our own creative thought. We live in fear of being ridiculed, of being isolated from the herd. We reject those whom we consider non aligned, the infidels who threaten our frail faith. We have to choose between herd orientation or intellectual alignment. If we get it wrong we are ostracised by our own kind; if we get it right, we are liberated forever. Political persuasions are much in vogue as a refuge from our unchannelled thoughts. So are religions. As long as we are aligned behind a powerful and disciplinarian cultural structure we are able to defer our move towards maturity by perpetuating the unliberated perspectives of the dependent child. We seek filial refuge in parental institutions. Politicians know this, and so do cult leaders, witch doctors, self appointed messiahs and itinerant saviours. We enjoy being led, and our leaders enjoy leading us. Soon we are following the profitless path of repetitive thought which drives itself around in circles, rather than thinking some creative and original thoughts of our own, and risking alienation from the tribe. Circular thought is the barrier to individual liberation, and mankind's lingering Oedipus complex is the obstruction. Freud held that the Oedipus complex, (expressed here as the inability to separate from the ‘birth mother’, ‘the mother church’ or ‘the mother state’) is at the core of every human neurosis. The complex is extended beyond infantile fixation to a life long struggle to break the umbilical cords of our social inheritance, and be born into unconditioned and unrestrained maturity. The security afforded by a parent is the same security offered by the authoritarian political, religious or social structures of the world. These primary ties to parental institutions give us refuge in both the physical and intellectual sphere. When they become threatened we respond with all the extremes of passion that generate anarchy, racism and genocide. The main religions of the world now number so many diverse sects, divisions and chapels that their real message is often lost in the battles that are fought in their name. This is the visible face of circular thinking; we have long forgotten what our gurus said and are no longer able to interpret what they meant; we are locked into a mode of self expression quite devoid of individual input. We are performing a repetitive cultural ritual in obedience to our ancestral thought conditioning. The great patriarch Abraham lived 4,300 years ago and became, with his sons, the father of not only Judaism but of Islam and Christianity as well. Abraham’s wife Sarah failed, initially, to bear him a child. So in the custom of the day he lay with Sarah’s handmaid, Hagar, and she bore him a son called Ishmael. The event triggered Sarah’s fertility and not long afterwards she too brought forth a son, who was named Isaac. Now regretting her husband’s liason, Sarah drove off Hagar and her child into the desert. They wandered far south to the Arabian peninsular to dwell among the desert nomads; there Ishmael founded the Arabic people. Isaac’s son, Jacob, journeyed North among the settled tribes becoming established in the fertile Jordan valley and founded the Jewish race. And so started the cultural division between Arab and Jew that persists to this day. What unholy divisions the redoubtable Abraham sired with generations of religious bloodshed to mark the passing of time; fundamentalist sects are, even in this enlightened age, on the increase - and are invariably powered by circular thoughts unable to break free of matriarchal or patriarchal conditioning. True to our ill channelled passions, we are ready to kill rather than stray alone into a reasoned world of tolerance and spiritual harmony. When driving in Saudi Arabia recently I was stopped near Mecca and directed to the, thus named, 'Christian Bypass', a road especially constructed to keep infidels out of the Holy City. Jews aren't even allowed into the country. In all these religious disciplines the repetition of circular thought, the perpetuating of unreasoned doctrine passed on from parent to child, has locked the faithful into intellectual stagnation powered by pure memory functions, devoid of any creative, original or personal input. Whilst we won't change history with idealistic observations, I feel we can take immediate steps to disempower the negative whim of secondhand thought patterns by replacing them with our own original perspectives. Those that dare to stray from the herd will find rich grazing in their maturity and their new found liberation. I believe the true synthesis of science and spirituality is only just beginning, and our generation is responsible for its development. The logical, left-brain stance of science, manacled for generations by indisputable but incomplete scientific facts, is now finding ways to embrace the sometimes inexplicable and generally intuitive perception of the right-brain. Words like morphic resonance16 are entering our vocabulary as scientists strive to reconcile fact and fancy, matter and spirit. 16Morphic resonance is the phenomenon of mutual awareness between plant species, animals and mankind that cannot be explained in scientific terms - despite being readily demonstrable. Rupert Sheldrake’s study into this field has upset many eminent scientists.